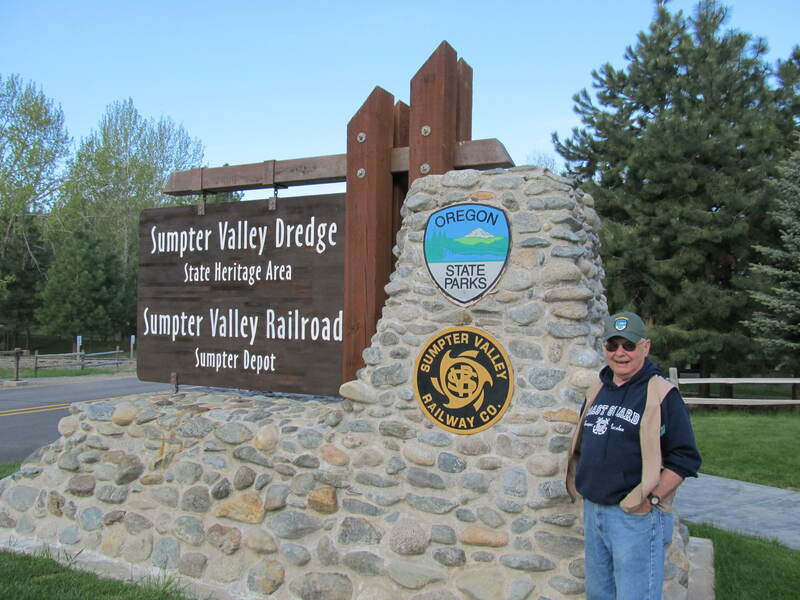 Each year the Sumpter Valley Dredge State Park has the pleasure of having hosts come to our park to assist us with the maintenance and interpretive duties that come with making the state park what it is. This year we had the pleasure working with Marvin Fackler. 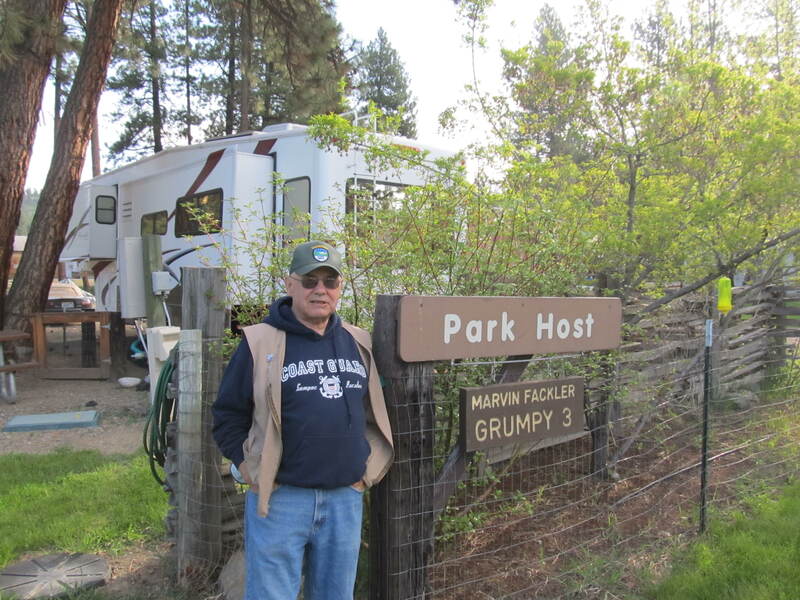 Marv, aka Grumpy-3, has already a long career with Oregon State Parks having worked at several coastal parks including Cape Lookout and Beverly Beach. He had dropped in at Sumpter a few times over the years on motorcycle trips and to drop a quick hello. On December of 2011, Marv called to request to have May through July of 2012. We were happy to oblige. Marv jumped right on every project or duty assigned to him and expressed interest in getting more involved with the interpretive programs taking on providing tours and gold panning during the week. In no time at all, Marv a routine down and you could see him going through his duties with a grin on his face. 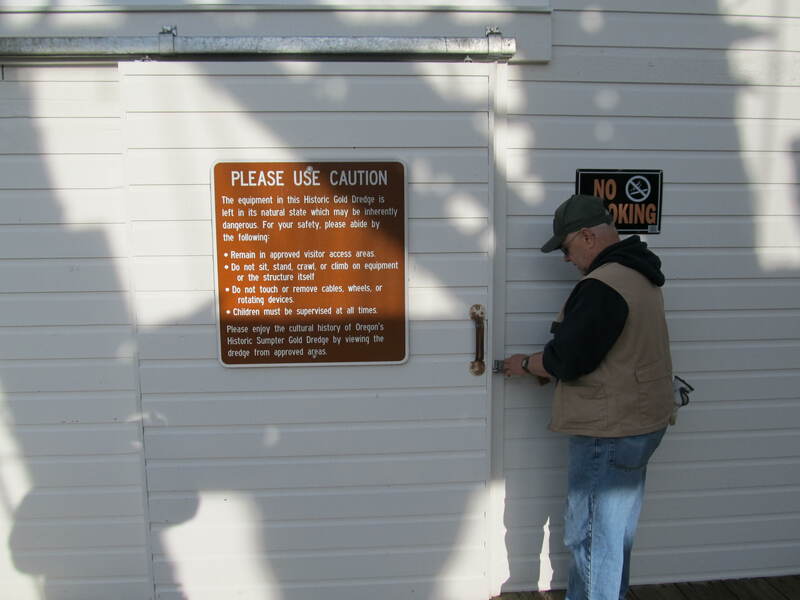 Many times we would walk by the Interpretive Store to see Marv going up to a group of visitors and enthusiastically calling out “Who wants to go gold panning!”. Marv had a strong sense of patriotism and the desire to make sure that we display our colors proudly. He made sure that we had the list of days when the our flags should be half staff and donated a POW flag. Muskrat Sally and Muskrat Sam also became a favorite of his. We looked forward to his photos and reports of his sightings of them from when he would open and close the dredge. It is uncertain why bad things happen to good people. Unfortunately, Marv lost his trailer to a tree that came down destroying the trailer and causing significant damage to his truck. Marv made it out unhurt and we are extremely grateful that he was not injured or worse, but the whole incident was a terrible, early end to what had been a great season. We are grateful to Marv for spending his season with us, for his hard work, enthusiasm, and for the good times. We wish him luck as he works towards getting things set up for his next ventures. He has said that he would like to come back….and he would like to see small bushes by the host site when he does. From all of us at the Sumpter Valley Dredge State Park…. 4 Responses to Thank You , Marv. Marvin was definitely a great addition to the Dredge Park this summer and we were fortunate to have met him and truly look forward to seeing him again! It was a pleasure to see the Dredge Park through his eyes and we are most grateful for all that we learned from him. We would like to thank Marvin for his service to our country and the Sumpter Dredge Park! We thank Marvin for sharing his patriotism with us too! We are so sorry this great season had to end on such a scary note, but we are glad he is okay and would like to wish him the best as he travels down the road! And we are sure muskrat Sally and Sam will miss him as well! We hope to see Marvin in Sumpter again soon! Thanks much for the kind words. I can say that my stay at the park has been one of my great summers. I enjoyed Sumpter a lot. All the folks were great to me. I can’t wait to get another rv and come back. i had a great time with my papa (Marvin) it was fun helping him every night!